I’ve written before about the wonderful world of Bircher Muesli so I won’t belabour the point toooo much but this stuff seriously is one of the best ever breakfasts! Because the oats are soaked overnight and served cool along with tasty fresh ingredients like yoghurt and fruit, it’s so much more refreshing than bog standard porridge oats. This version includes whey protein powder. The result is a perfect balance of carbs and protein that makes this an ideal breakfast to follow tough workout. (Indeed, it’s my go-to morning breakfast after CrossFit if I don’t fancy making protein pancakes). I use unflavoured Pulsin’ Organic Whey Protein but you can substitute any protein powder of your choice. This recipe serves two Monica-sized portions but if you’re a big dude this will probably serve just one. 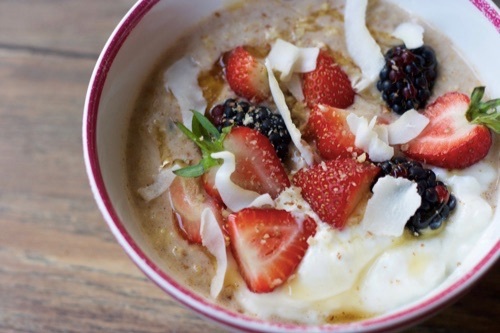 Adapted from the overnight oats recipe from The Body Coach’s 90 Day Plan. Combine the oats, protein powder, flax seeds, pumpkin seeds, cinnamon and salt in a large bowl. Mix together thoroughly. Add just enough water to barely cover and mix again. It might be a little lumpy but don’t worry! Leave to soak overnight or for at least an hour. Add 50g of the yoghurt and mix thoroughly. Divide into two bowls. Add a 75g dollop of yoghurt to each of the bowls. Garnish with the berries, honey, and nuts. I like to have most of my yoghurt on the side and use the yoghurt and fruit as garnish but if you want to make this grab-and-go, just mix it all together the night before and go. You can make big batches of this stuff ahead of time which should keep for a few days in the refrigerator. 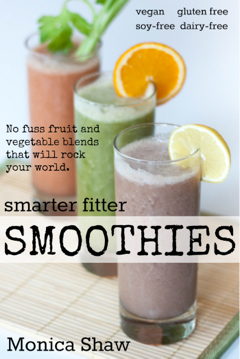 You can also chuck all of the ingredients into a blender and blitz it all up to make an awesome smoothie!